There are some great reasons to make cocktails at home. It's much less expensive, we can customize the strength and sweetness to our taste and, of course, it makes us very popular with friends! All last year we had such fun creating amazing cocktails and there are lots more coming! But now that the new year is here, we thought it was time to take a step back and go over some basics. As we make the drinks, we're always making notes and we'd like to share some of what we've learned. This is by no means an all-encompassing body of cocktail knowledge but rather some tips and tricks we've picked up along the way. So starting today, we begin a three part series on the art of cocktail making. In part one we'll discuss the basics including glasses, tools, gadgets and common liquors as well as providing some useful tips. Part two will go over common mixers, garnishes and rims as well as providing some useful syrup recipes. And finally, we'll culminate with part three on Friday (Cocktail Friday!) with a terrific new recipe. Cheers! When we first began trying our hand at cocktail making, we looked up recipes for classic drinks. After making them, we'd decide if we liked them as is or if we wanted to tweak. More and more, we liked our tweaked versions better and that gave us the confidence and experience to get more creative. We get inspiration from many sources including cocktails we've had, seen or just read about. Once we moved past the classics, we were inspired to tweak lots of different combinations. For example, our Frozen Key Lime Daiquiri idea grew out of a Key Lime Martini we had while on vacation. The two recipes are quite different but the inspiration source was the same. Finally, some of our flights of fancy result in very new cocktails that we haven't been able to find elsewhere. And that is the most fun of all! Very simply, both Brian and I have to like it. Not each drink needs to be our favorite but we have to agree that it tastes good and is well balanced. And yes, there have been times where we've disagreed on cocktails and those definitely did not make the blog. Our freezer frequently looks like a frozen cocktail lounge. Nestled in with the frozen peas are various bottles of vodka and gin along with a decent selection of glasses. Most cocktails taste best cold and having frozen glasses will keep them that way longer. Keeping the liquors in the freezer will mean that less ice is melted when you shake the drink and thus it will be less diluted. Having the appropriate glasses doesn't need to be costly or involve rare cut crystal. Brian and I frequently pick up glasses at inexpensive home basics stores that sell them by the piece. And, much as we love Williams Sonoma and Sur La Table, stores like Home Goods and other discount retailers offer much better prices and a great variety. Goblets, used for water, iced tea and any soda filled cocktail such as a Mint Julep or Mojito. Rocks glasses, also known as Old Fashioned glasses, are typically used for whiskey based drinks like Manhattans or the Old Fashioned cocktail itself. 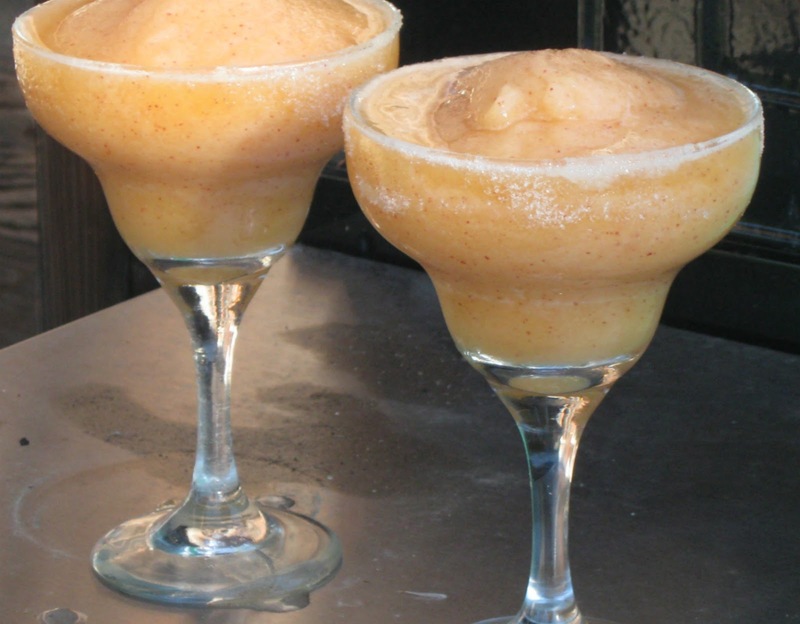 Margarita/Daiquiri glasses are typically used for frozen drinks such as the Creamy Banana Daiquiri, the Frozen Key Lime Daiquiri and our beloved summer staple, the Frozen Peach Daiquiri. Martini/Cocktail glasses can be used for almost any cocktails. We have the basic martini glasses and also a set of these more interesting shapes which we found on sale. There are loads of cocktail paraphernalia and stores and web sites devoted to it. And all those odds and ends, trinkets and do-dads can get quite costly. Last year we vacationed on Cape Cod and, while strolling around Provincetown, happened upon a great store called Drinkx. We had lots of fun browsing in this cocktail mecca but browsing was all we did. When it comes right down to it, your must-have list for cocktail making is quite short. You'll need a cocktail shaker and a jigger, both of which can be found at many inexpensive stores. A standard shaker, like the one in the photo, has a strainer built into the cap and comes in a few different sizes. Boston-style shakers have glass bottoms with measuring lines and a metal shaker top. The advantage is the built in measuring cup but you will need to purchase a separate strainer. Measuring jiggers come in a variety of sizes. Ours is a half ounce on one side and full ounce on the other but you can purchase a number of different size options. Because cocktail measurements need to be precise to produce a well balanced drink, we do strongly recommend using a jigger. The long metal piece with the white tip in the photo is a muddler, and a rather recent addition to our stash. In the past we've always muddled our herbs in the shaker with the back of a wooden spoon but we saw the muddler on sale during a trip to Home Goods and bought it. Now that we've been using it, we can say that it doesn't perform any better than the wooden spoon. Which liquors to keep at home is strictly a matter of personal taste. Although we've posted a few gin and whiskey cocktails, we're most partial to vodka and rum based drinks. Brand preference is also very personal which is why you rarely see the brand of liquor noted in our recipes. When it comes to flavored liqueurs, you can spend a fortune and devote a great deal of space to stocking the multitude that's available. At times we've been guilty of over-buying very taste specific liqueurs but there are quite a lot more flavorings we've created ourselves. We frequently find that liqueurs can taste "fake" and leave an aftertaste. Just as you need to be careful not to use too many flavor extracts when baking, using natural products to flavor cocktails will usually produce a better taste, not to mention a much lower cost. So, rather than purchase apple, pear or pumpkin liqueurs, just to name a few, we've used unsweetened apple juice, pear juice and canned pumpkin puree. If a particular fruit flavor is not easily available in juice form at the supermarket or if it contains too much added sugar or artificial flavors, we just puree the fruit in a blender, add a little water if needed and then strain. Strawberry, lychees and honeydew melon make delicious purees! A frequent ingredient in cocktail recipes is a bit of orange liqueur and the most common is Triple Sec. Even half an ounce can smooth out and blend several different flavors in a drink. Cointreau is considered a better grade of Triple Sec and it provides a smoother flavor. It is also, however, considerably more expensive and contains much more alcohol. We keep both around and, in our experience, Cointreau is worth using when the drink has fewer ingredients thus allowing its smoother flavor to shine. To see our complete list of our cocktail recipes to date, click on the A Cocktail Life tab at the top of the blog. In the lead in picture there are a few bottles containing what looks like fresh squuezed juice and simple syrup. Where did you get the bottles? Are they just pourers on empty bottles or commercially available? They almost look like that orange soft drink (Orangina?). I like them. Thanks! You're correct that those bottles contain lemon juice, lime juice and simple syrup. We were on the hunt for cute little bottles that would fit in the fridge and I wanted to have a few that matched. I don't remember where we picked them up because we looked through every housewares store on a few vacations. They were empty and we bought a bag of pourers (any housewares store should have those). But I have re-purposed beverage bottles before when I've liked the shape so if you see a bottle you like at the supermarket, just go ahead and buy a few. This is a perfect post for people new to setting up a home bar, and for understanding a few of the complex things. I'm looking forward to Parts 2 and 3! I'd like to link to this post on my website, MouseAndFork.com, so I can direct shoppers to this information. Thanks! Anita, you have amazing drinks, and I love cocktails. I will definitely be trying some of your cocktail recipes. Thank you for this great post.